This Halloween, I was vascillating between doing something really simple (a rock, a tree, etc.) to throw people off (but… you’re not just a rock, right? What’s the joke?) or a character I love. 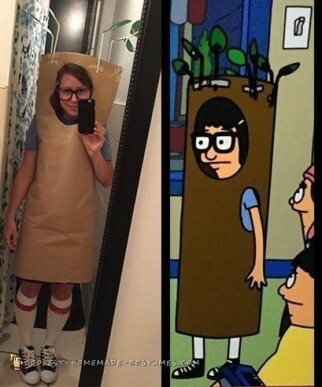 Then, I watched the perfect episode of Bob’s Burgers and Tina Belcher as a Tree in the instant classic dinner theater play Dreamatorium. Annnd here we go! Funniest moment: power walking through the subway… when I couldn’t stretch my legs for fear of ripping the tree trunk. This costume was so much fun to make and, even though I was mistaken many times for a sprout, the people that got it, really did and were so excited. Also! Got to respond with, “No, don’t!” to everything (finally remembered my lines! ).